Boat fenders are an essential piece of kit on any boat. They are protective, air-filled cushions which can be placed along the side of your boat. As you moor against a dock, or other boats, fenders provide a protective barrier, and help stop your boat from getting damaged. We reviewed dozens of boat fenders to identify the best of the best. We considered features such as the size and shape of each fender, and whether they came with fender lines. This fender provides quality, durability, and a wide range of colors, all for a reasonable price. For our top pick of all the boat fenders we reviewed, the Polyform US G-5 Fender was a clear winner. The reinforced eyelets on either end of these cylindrical fenders mean you can use them vertically or horizontally. *Ratings are from Amazon at time of publication and can change. Out of all the boat fenders we reviewed, the Polyform US G-5 Fender came out on top. This fender is recommended for boats which are between 20 and 30 foot in length. There are also 5 other sizes of the same style, meaning you can select the correct one for your length of boat. This fender ships pre-inflated, meaning you can get out on the water right away. It has a Polyform inflation valve which can be used to adjust the pressure of the fender, but you will need an adapter to do this. Many reviewers on Amazon are impressed with the quality and durability of these fenders. This value pack of 2 fenders comes with fender lines, and a 2 year warranty. Our Runner Up pick is the Extreme Max BoatTector Fender Value 2 Pack.These fenders are made from premium, UV resistant materials. The reinforced wall thickness, and ribbed design work together to provide ultimate durability and stability. The reinforced eyelet at each end of these fenders is molded in a way that prevents ripping or tearing of the fender. It also means that you can hang these fenders vertically, or horizontally. This value pack includes two solid braid fender lines made from multifilament polypropylene. These flexible lines are designed to reduce kinks and make trying your fenders a breeze. This quality fenders offers great strength, and an easy to use design, for an excellent price. Our budget pick is the Taylor Made Hull Gard Fender. This fender offers an excellent range of features for a budget price. A very useful feature is that it can be easily inflated using a standard needle designed to inflate footballs. This means no specialized adapter is needed. This fender measures 5.5″ by 20″, and is recommended for boats between 15 and 20 feet. The unique, slightly oval shape is designed to prevent this fender from rolling out of position, which minimizes hull rub and of course, means the fender stays exactly where you want it. This multipurpose piece of kit can double as a round fender, or buoy, the choice is yours! The best round fender we found during our review is the Polyform A Series Buoy. This versatile piece of kit can be used as a fender or buoy, depending on your needs. Round fenders are a great choice for larger, heavier boats, and this comes in a wide range of 6 sizes. The unique valve system used by Polyform is reliable and easy to use. You will need a Polyform Inflation Adapter to inflate this product though. This inflatable boat fender is made of premium vinyl and can easily be inflated to your preferred pressure. The best inflatable boat fender we found during our review is the Shoreline Marine Ribbed Inflatable Fender. While this fender is shipped pre-inflated, the air pressure can easily be adjusted to suit your sailing conditions. The Shoreline Marine Ribbed Inflatable Fender is made from premium, marine-grade vinyl. The raised ribs along the side help to maintain the stability of the fender, as well as protect it from damage. If you have a boat, you need boat fenders! 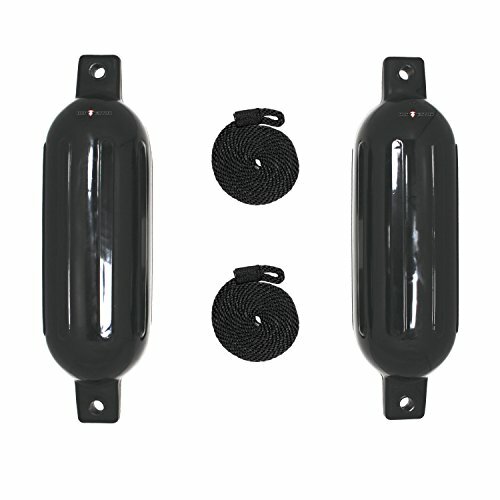 They’re an inexpensive way to protect your boat against knocks and bumps. Fenders are also easily replaceable if they do get damaged, while repairing your boat can definitely be a more costly exercise. Boat fenders come in a wide range of shapes, sizes, and colors. If you spend a lot of time at sea and don’t relish the idea of having to store bulky fenders, then many are inflatable, so you can deflate them and store when not in use. So whether you enjoy a leisurely fishing trip using your trolling motor, or an expedition out to sea, there will definitely be a boat fender out there to suit your needs. Shape. Boat fenders traditionally come in two shapes – round, or cylindrical. The type and size of boat you have will determine which shape fender will best suit your needs. Some cylindrical fenders have eyelets at either end, which makes them more versatile as they can be used either horizontally or vertically. Inflatable or not. Many fenders are inflatable, but some are pre-filled and you cannot deflate them. If you plan on stowing your fenders away once you’ve set off for a long trip, it’s a good idea to choose an inflatable fender. You can deflate these and they take up much less stowage space. Inflation method. Some inflatable fenders require a specialized adapter to inflate. Others use a standard football needle. ear in mind that you’ll need to purchase an adapter if you choose a fender in the former category. Size. In choosing the best size fender for your boat you need to take into account the boat length and weight. You’ll also need to consider the conditions you moor in. In rough waters, additional fenders add extra protection. As a general rule, you’ll want 1″ of cylindrical fender diameter for every 5 feet of your boat’s length. For round fenders, it’s 2″ per 5 feet. What is a boat fender and how does it work? Boat fenders are an air-filled, plastic cushion. They are usually round or cylindrical, and their purpose is to protect your boat from damage as you moor against docks, and other hard surfaces. They absorb the movement energy of your boat by changing shape as your boat bumps against the dock. If they’re in the correct place, the fenders will touch the dock before your boat does, allowing you to come to a smooth stop. What type of boat fender do I need for my boat? There are a range of different shapes and sizes of boat fenders. Choosing the right fender for the right situation can help give your boat the best possible protection. As a general rule, cylindrical fenders are best suited for lightweight, short boats, while round fenders work better for heavy, large boats. There’s also a range of other fenders, such as transom fenders, and fender cushions. These aren’t essential but you may choose to add them to your boat. How do you hang a boat fender? You want to hang your boat fenders an inch or two above the waterline. Any lower and they will likely end up collecting marine algae growth and need more regular cleaning. Any higher and they will swing about, and not necessarily protect your boat where needed. To secure the fenders once they’re at the correct position, tie them to a cleat, rail, or other solid fixing point. The best knots to use are a running hitch, clove hitch, and half hitch. What’s the difference between a boat fender and a bumper? You may sometimes hear boat fenders being referred to as ‘bumpers’, but that’s not technically correct. Boat fenders provide protection for, and are fastened to your boat. Bumpers also provide protection for your boat, but are attached to a dock. They are also an essential piece of kit though, so we’ve included a small selection of them in our round-up of other boat fenders we reviewed. We looked at 20 other boat fenders. Even though they didn’t make our 5 best boat fenders, they’re the best of the rest and each is still a great option for your boat. The information you’ll need to compare each one is included with the listing. This round boat fender is made from a durable yet soft plastic blend, designed to protect gel coated hulls. 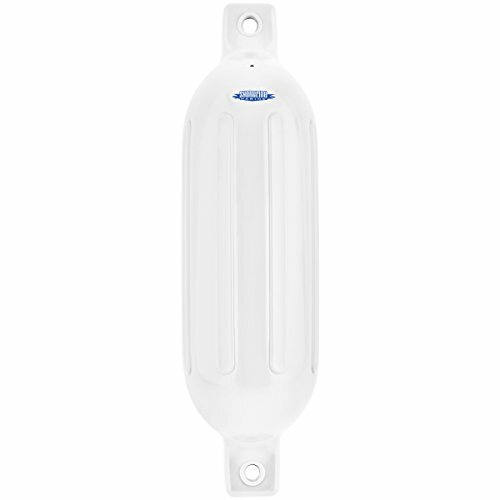 This all-purpose buoy can be used as a round fender, and has a high performance design. This slalom buoy is also well suited to use as a small round boat fender. This inflatable buoy is available in a huge range of 7 sizes, suitable for boats from 25 to 100 feet in length. This round boat fender is shipped deflated, but comes with a specialized needle for easy inflation. This inflatable, cylindrical boat fender has reinforced eyelet holes for durability and strength. The reinforced ribs along the side of this fender help to add extra protection. 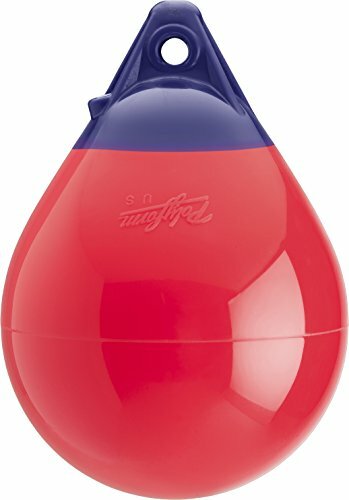 This lightweight fender is easy to use, and quick to inflate and deflate. This small, inflatable fender offers excellent value for money, and comes with a limited lifetime warranty. This large inflatable fender is available in a wide range of 9 vibrant colors. This unique pontoon fender bumper is designed to slide under the edge of your dock deck to provide protection when mooring. This dock-side bumper is available in 2 lengths, as well as a corner version for additional protection. This innovative hanging fender bumper provides maximum protection both above and below the rub rail. This heavy duty boat bumper is suitable fr both commercial, and personal docks. This horizontal dock bumper uses laminated fabric reinforced rubber to provide an excellent level of protection. This set of 4 cylindrical boat fenders are made from commercial strength marine vinyl. This soft contour fenders come in a value twin pack, and are designed to wrap around your gunwale and hull. 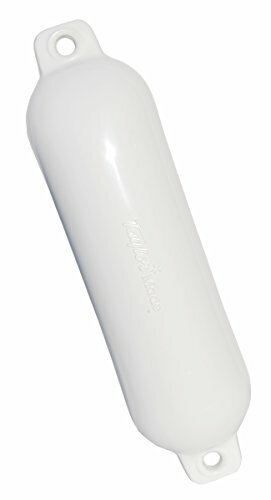 This pack of 4 cylindrical fenders have ribbed sides to prevent rolling on the hull of your boat. This multipack contains everything you need to start protecting your boat. This pair of round boat fenders come deflated, which also means they can be easily stored when not in use.